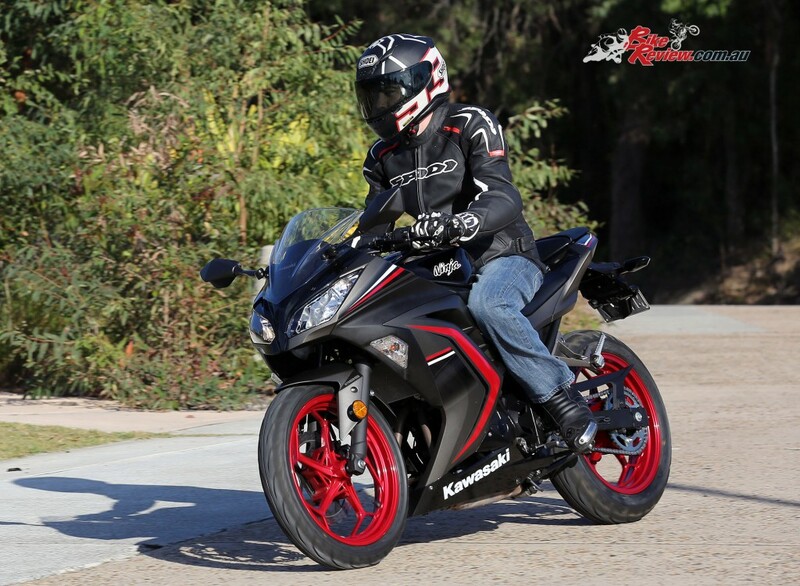 The Ninja 300 is a seriously cool looking bike, with more aggressive styling than its previous 250cc sibling and is the machine that helped move the relatively basic 250cc LAMS category into the much more competitive 300cc segment we now know and benefit from so much today. 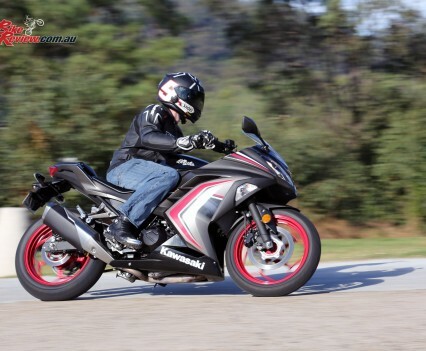 It’s really no wonder the Ninja 300 continues to dominate road bike sales, even facing some incredibly stiff competition, with the 300cc category a major battleground for the hearts and minds of new and returning motorcyclists. 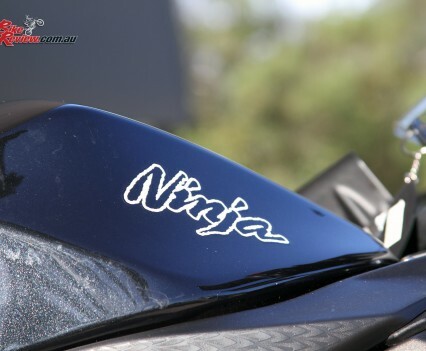 So what sets the Ninja 300 apart? 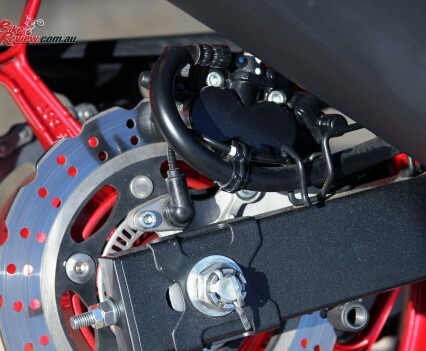 The chassis is a rigid diamond frame, with redesigned main tubes and high tensile steel components, and the engine is partially rubber mounted to reduce vibrations, while a wide rear tyre – now 140mm – assists stability but will probably remain unnoticed around the stylish 10-spoke wheels. 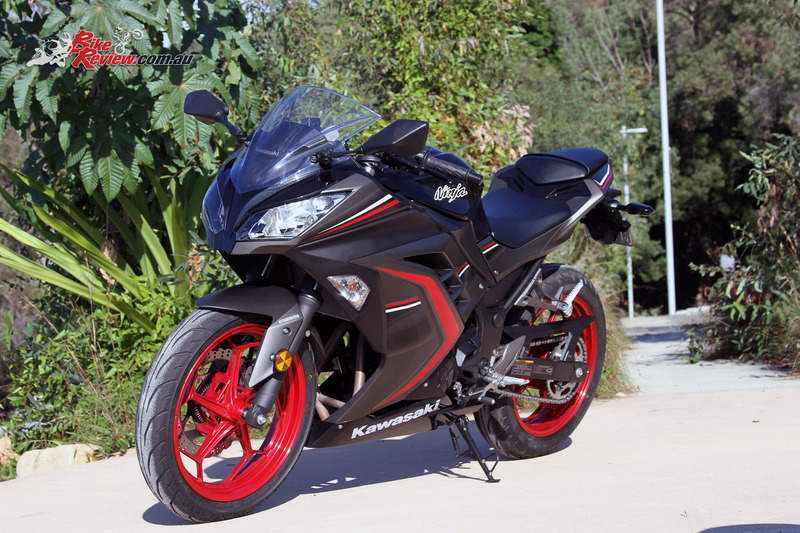 A F.C.C. 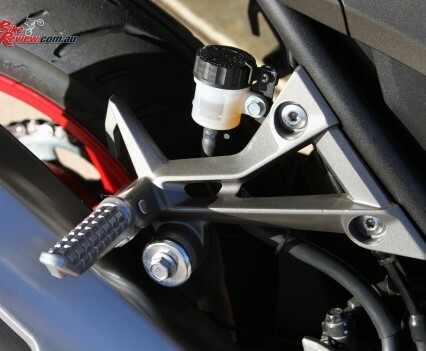 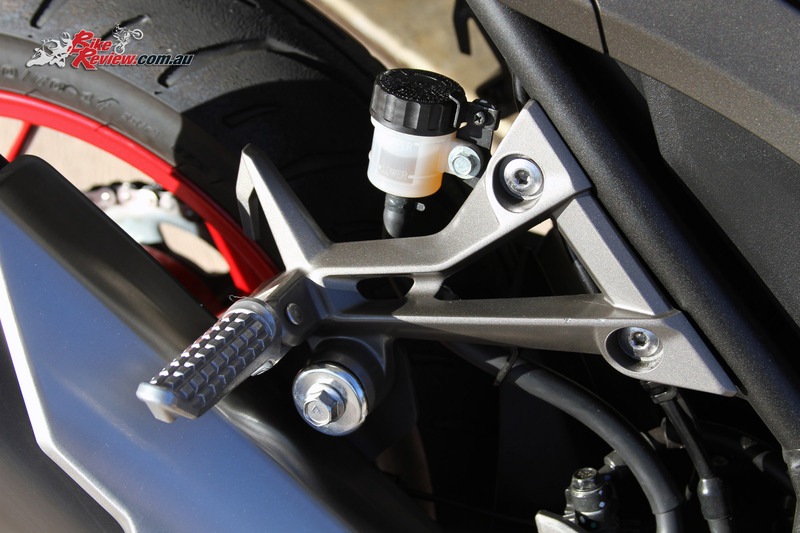 assist and slipper clutch was added, lightening the clutch feel and providing additional safety while downshifting aggressively to ensure maximum grip on the road, which is a particular benefit when you consider the Ninja 300 has a great rev range, and is a real screamer. 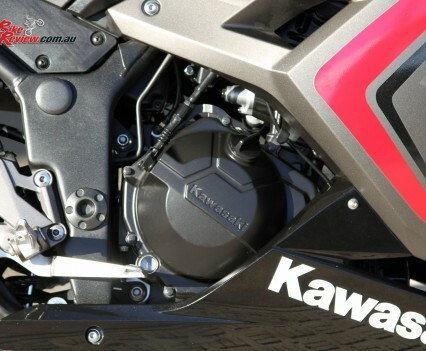 37mm telescopic forks and Kawasaki’s linkage-equipped Uni-Trak rear suspension provide stable handling, with five-step preload adjustability on the rear shock, ensuring that while basic, the suspension is capable of handling Australian road conditions, both good and bad and can be tweaked for rider weight. 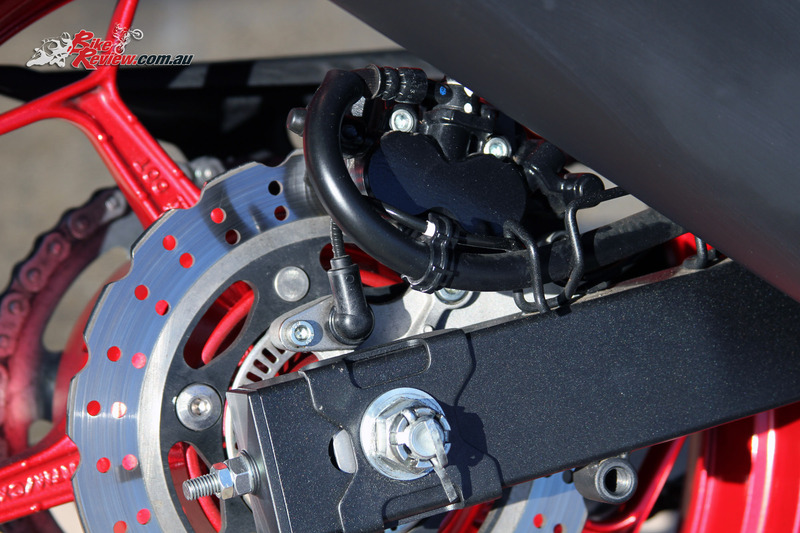 For heavy riders you’ll probably find the suspension easily overwhelmed however, as something to keep in mind. 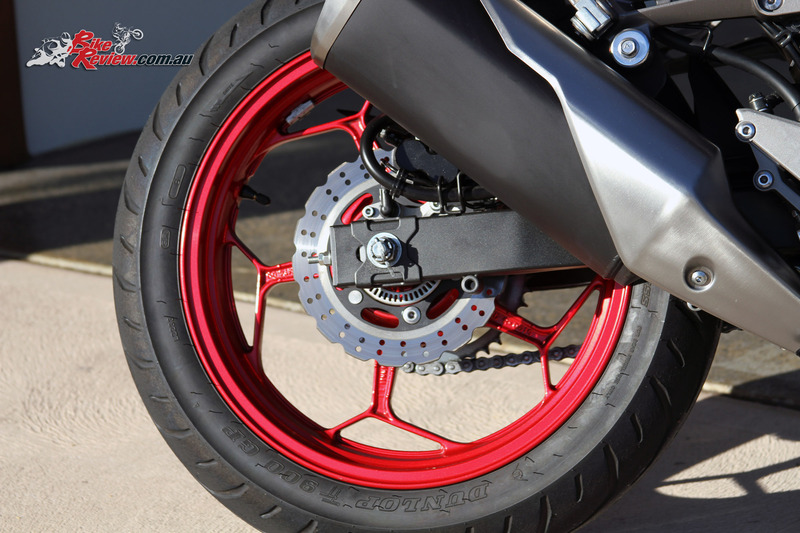 A 290mm front and 220mm rear petal disc grasped by two piston calipers provide ample stopping power and use new resin pads as standard, with ABS providing additional peace of mind and ensuring cold roads, cold tyres, or wet roads aren’t a reason to stay home. 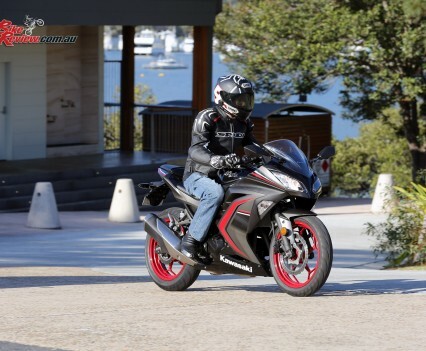 Unlike many of the single cylinder engines in learner bikes, the Ninja 300 has a 296cc fuel injected, liquid-cooled, DOHC, eight-valve parallel twin, giving the bike very manageable power down low with plenty of grunt once the engine is revving past 5000rpm. 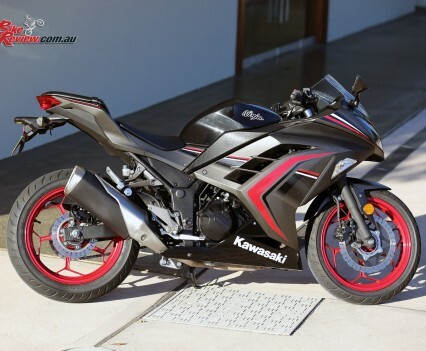 It actually reminds me of my own LAMS four-cylinder FZX250, but has significantly more torque down low and is a much easier machine to make the most of. 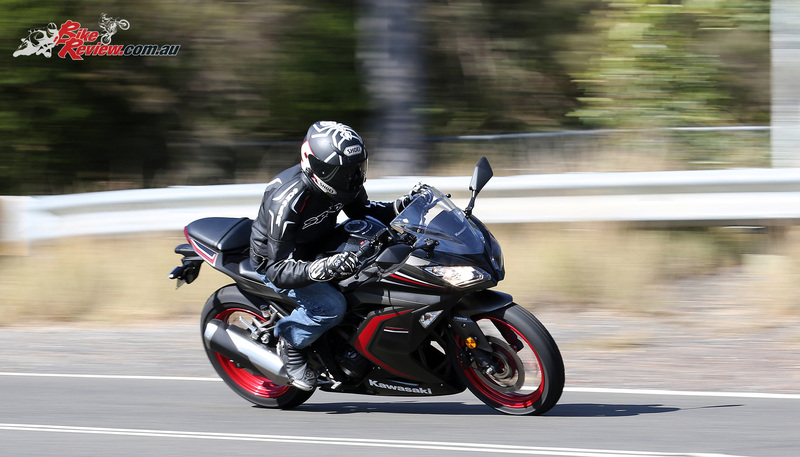 It still revs like crazy, ensuring you can have some real fun, and gets the blood flowing, with a great top end. 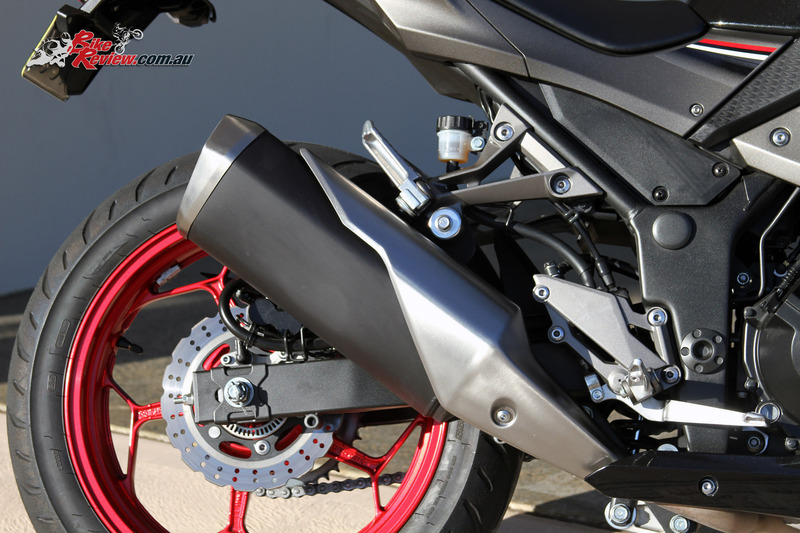 With a longer stroke the torque and speed of the Ninja 300 eclipse the previous 250cc offering and wider air intake ports with larger intake valves ensure greater airflow for the sporty engine. 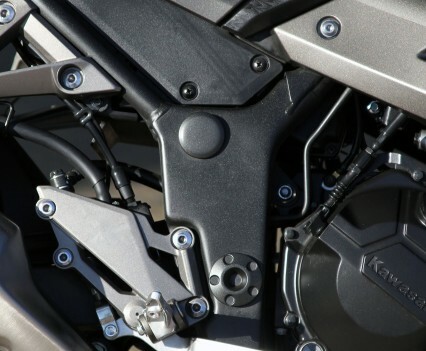 Lightweight pistons and a new compression ratio of 10.6:1 improve combustion efficiency and reliability, while new pistons are shorter and lighter, helping maintain a high maximum rpm despite the increased stroke. 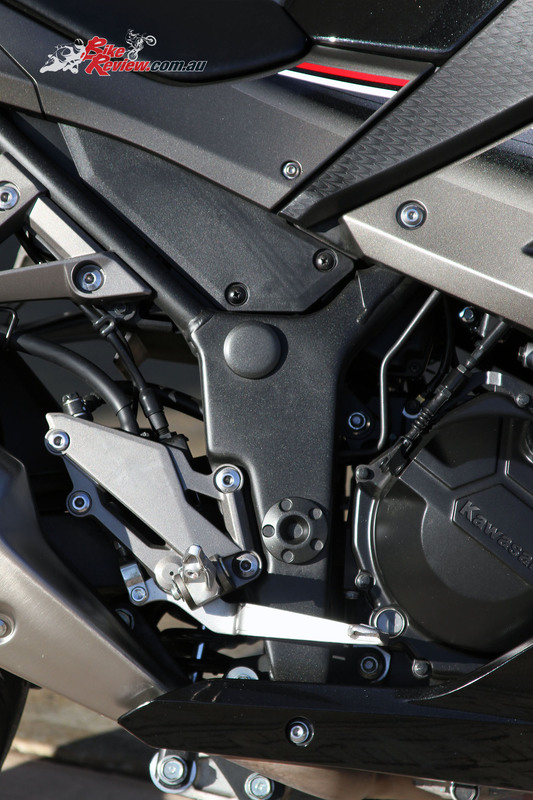 The pistons themselves also feature a hard alumite coating, for increased durability while the sleeveless, aluminium die-cast cylinders feature plated bores just like the Kawasaki ZX-6R and 10R. 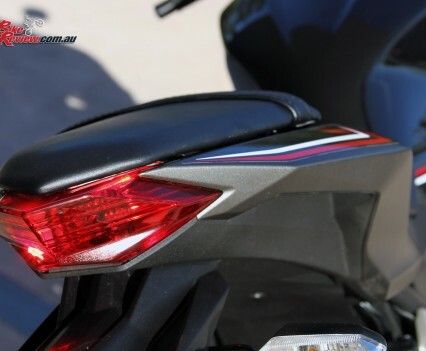 On the Ninja 300 you notice the bike has a low centre of gravity and feels incredibly light, while the low seat height ensures both new and old riders won’t feel intimidated. 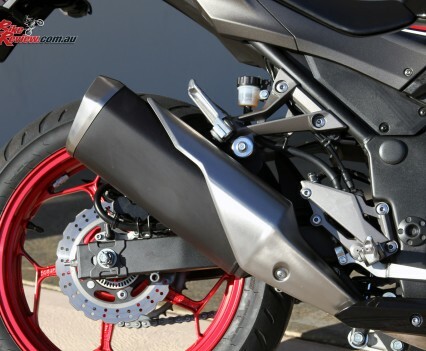 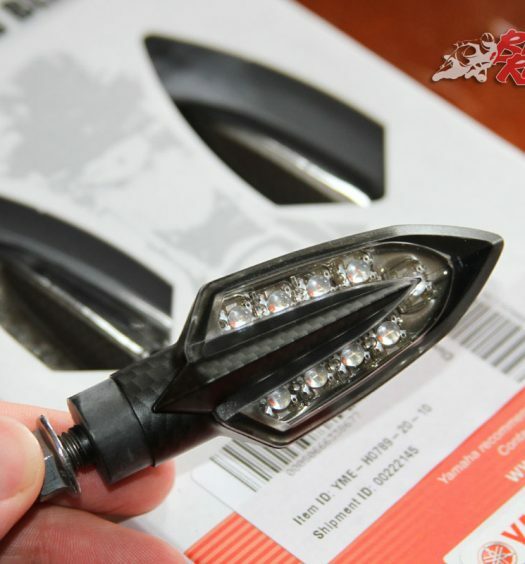 The fuel injected engine doesn’t exactly roar into life but you won’t upset any neighbours either, and options for aftermarket exhausts are numerous, with some really good value items available. 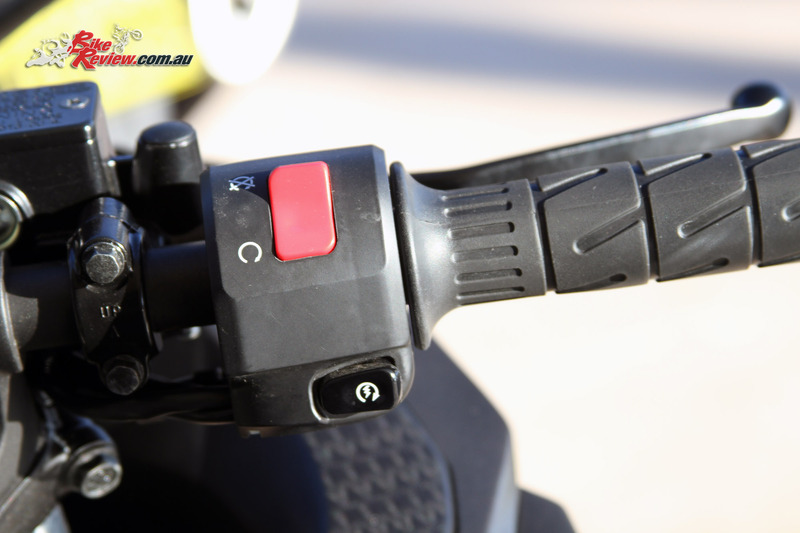 Moving off from stop the engine is incredibly smooth and a short first gear has you revving the bike from the minute you start moving. 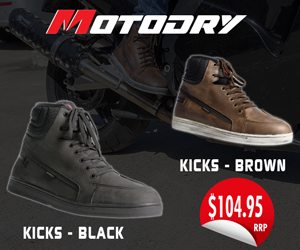 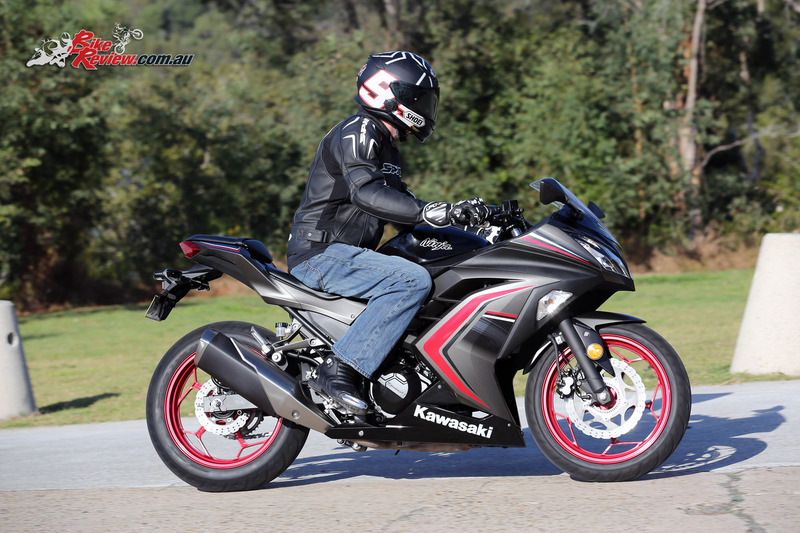 Keeping below 5000rpm you have the perfect learner bike, with smooth manageable power. 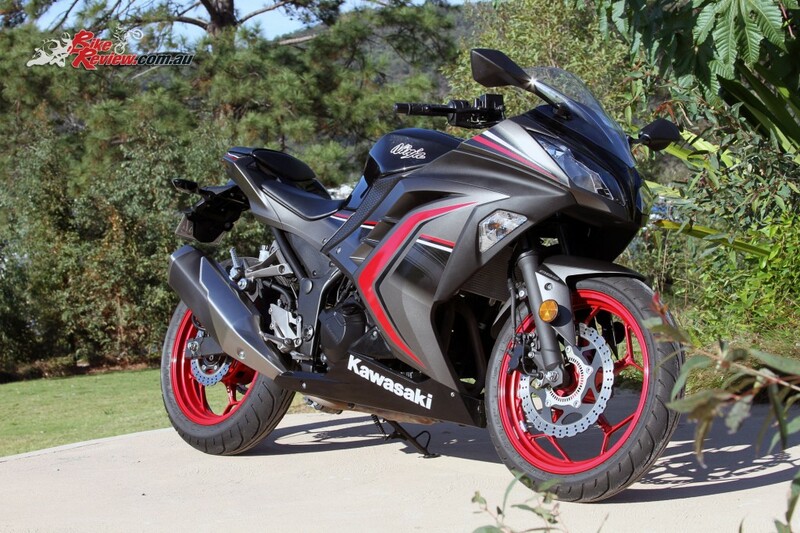 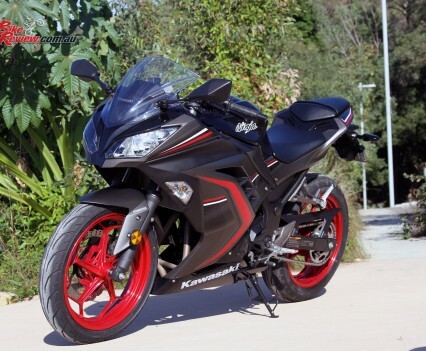 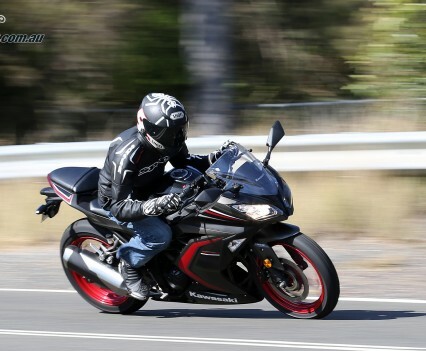 However, once you start revving harder the bike really rewards you with exceptional performance and acceleration. 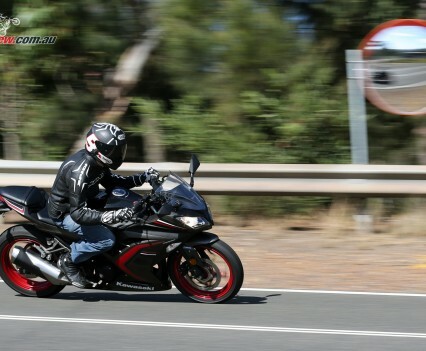 Dropping down a gear or two into the power band is rewarding, particularly if you have some nice twisties to explore, as the bike is extremely agile and inspires confidence, providing learner riders a great platform to develop their skills – or experienced riders a bit of fun! 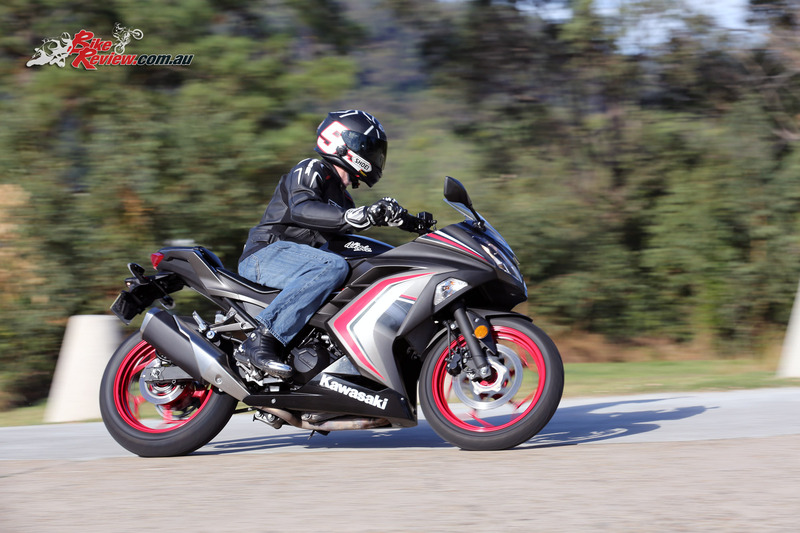 The Ninja 300 is also a great track machine and I’ve had a few great opportunities to test one out at the track, where it’s a machine that really allows you to push your boundaries and improve your riding skills. 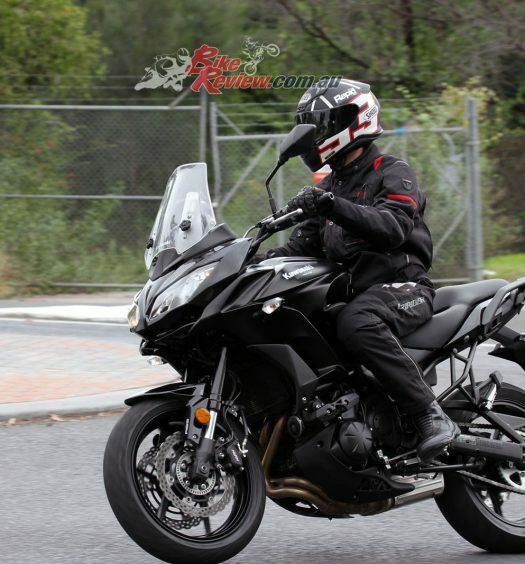 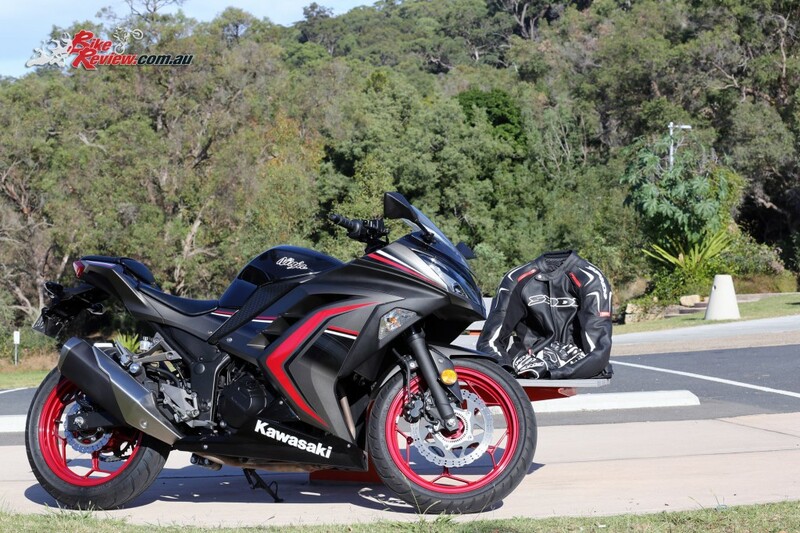 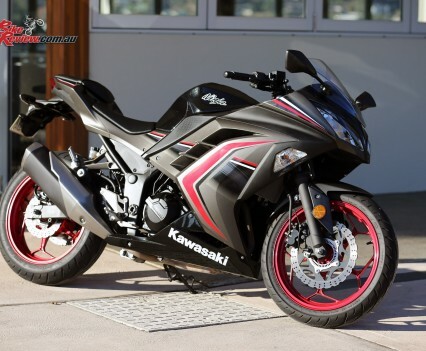 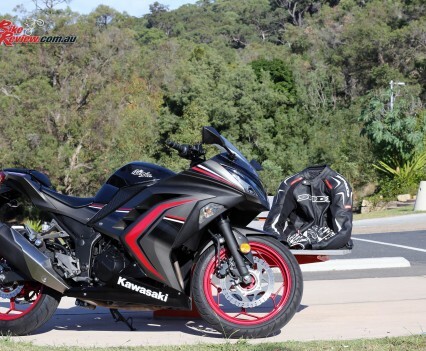 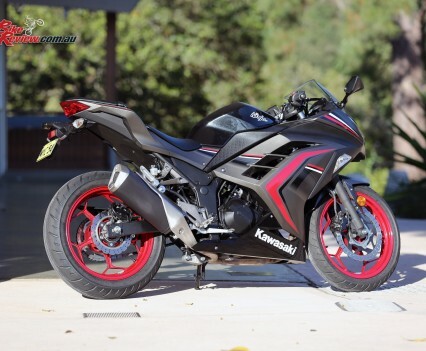 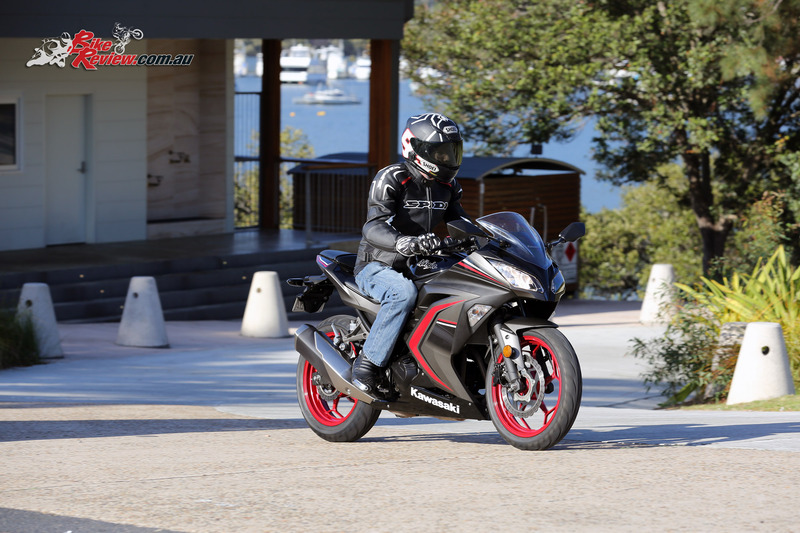 I saw almost 90km/h in second gear and I hadn’t quite reached redline while testing the Ninja through some local twisties and the ergonomics of the bike are perfect for sporty riding, without compromising a more relaxed commuting position. 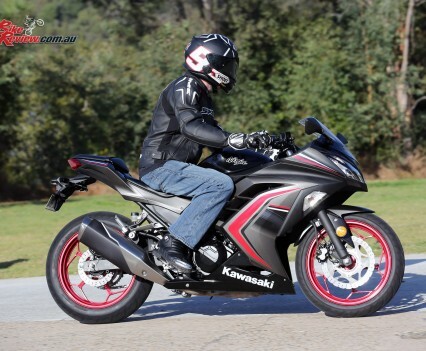 My only real criticism was at low speed in traffic when trying to maintain a steady throttle position in first or second gear, or when rolling off the throttle the bike was occasionally unsettled on deceleration, possibly due to fueling on a closed/closing throttle. 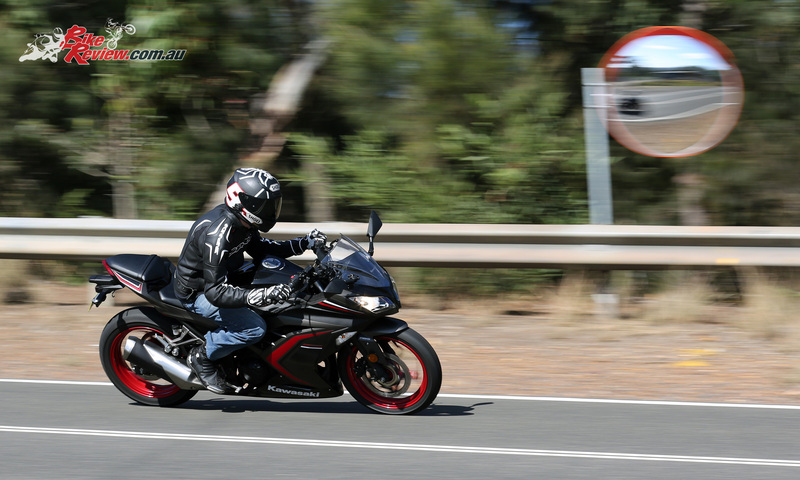 Rolling off the throttle from higher RPM wasn’t an issue however, and there was no such problems when riding sportily, or when not stuck in traffic. 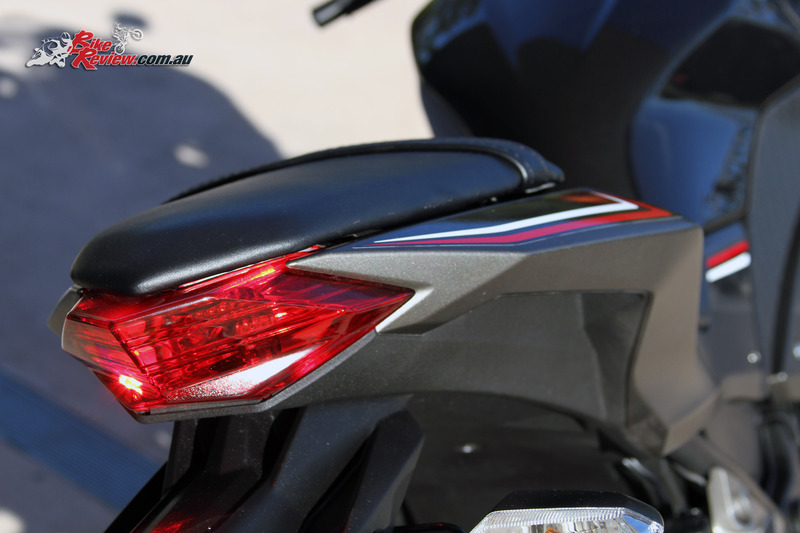 The test machine also only had 1000km on the clock so is still very very new. 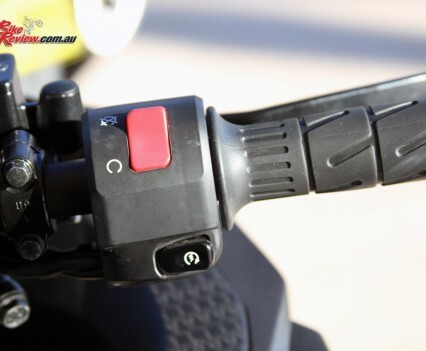 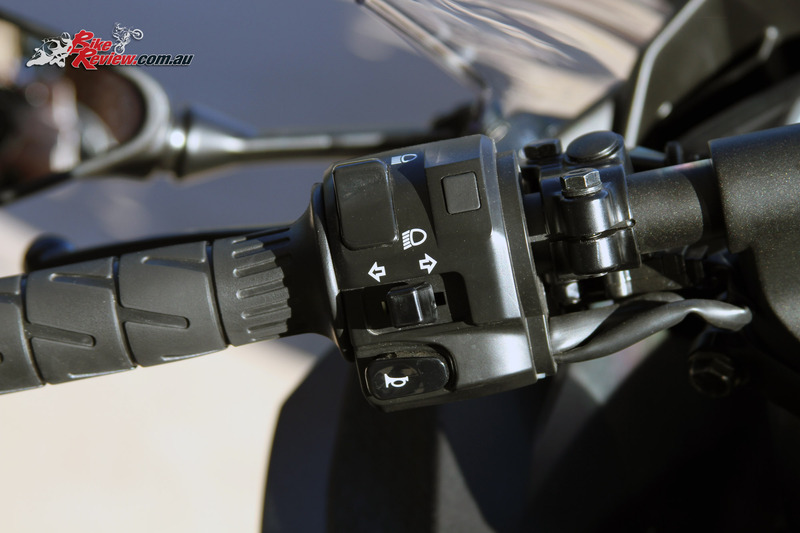 From an ergonomics perspective the reach to the bars is ideal – keeping the rider in an upright position which doesn’t strain the wrists, while the dash is readable at a glance. 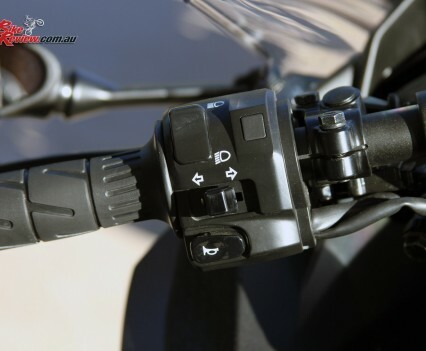 You’re also more in the bike than on it, for my 180cm/70kg frame, and it’s extremely easy to crouch down behind the screen, or shift your position on the bike when cornering. 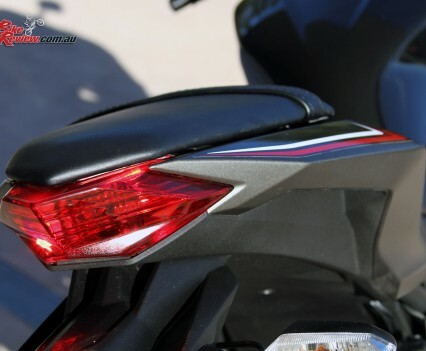 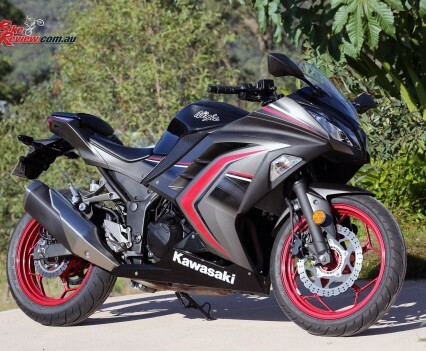 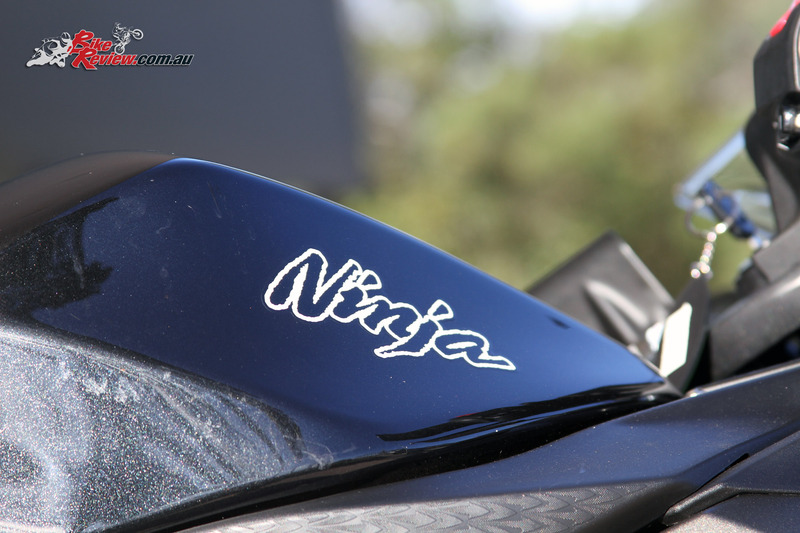 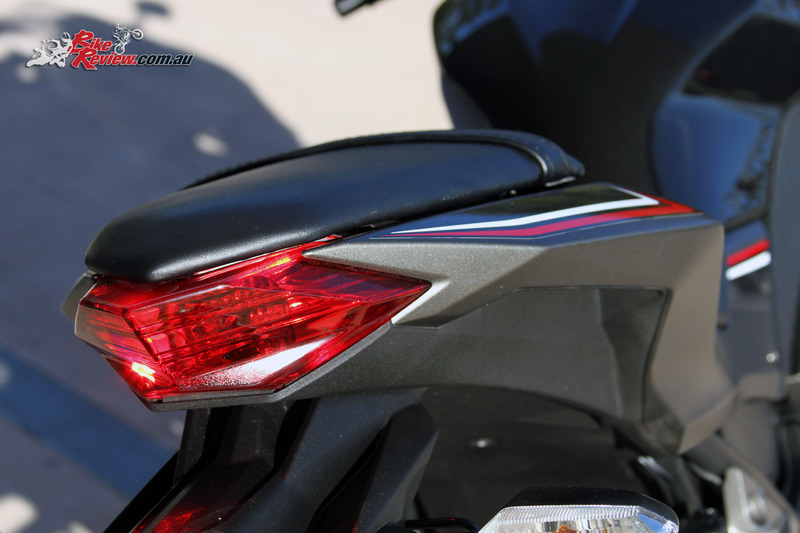 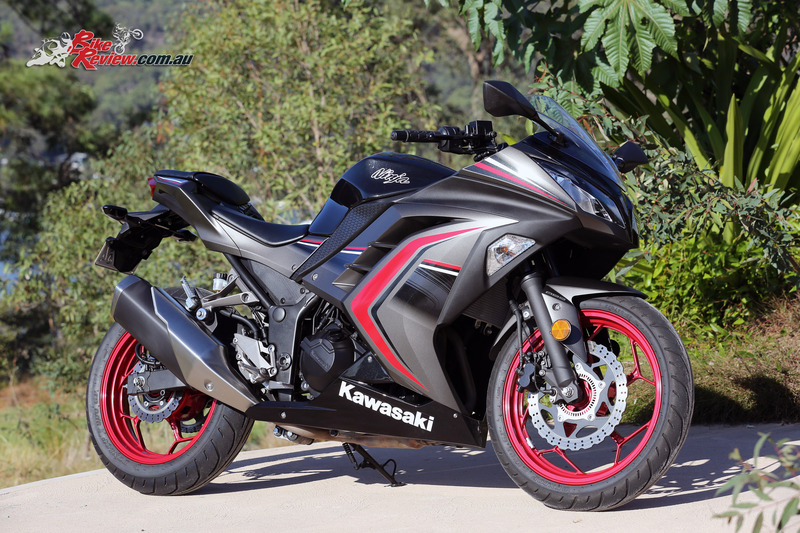 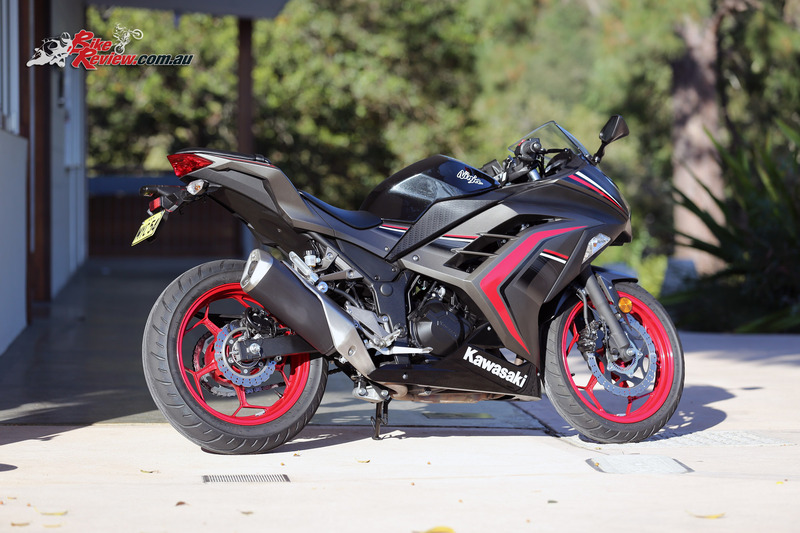 The Ninja 300 is a standout for its technology and overall package, with impressive styling and it’s easy to see why they have become an instant success since being released in 2012. 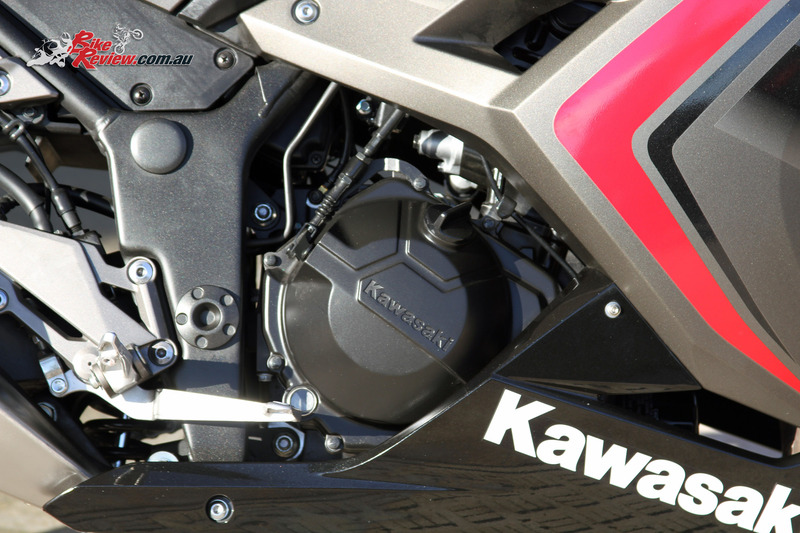 It holds it own even against the much newer competition, and is still a great option, even if you’re considering a larger capacity machine. 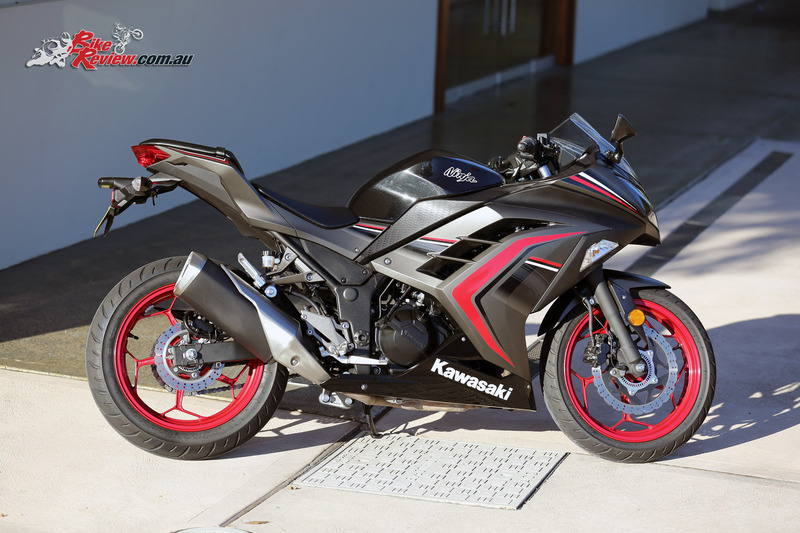 There’s plenty of performance, especially if you’re willing to really rev the bike out, and the chassis and brakes are great for the price. 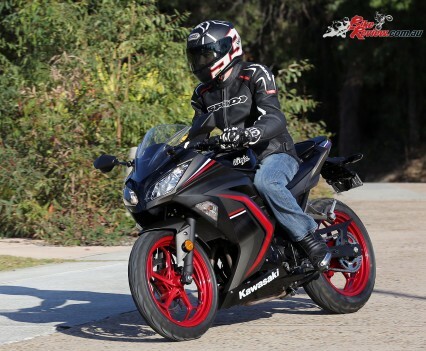 Definitely test ride a Ninja 300 if you’re in the LAMS or low capacity market, and remember to really test out that rev range. 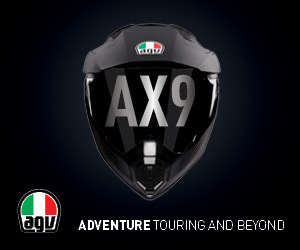 You’ll be grinning, I guarantee. 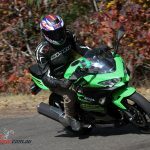 We also have a feature here about BikeReview.com.au racing the Kawasaki Insurances FX300 Ninja Cup. 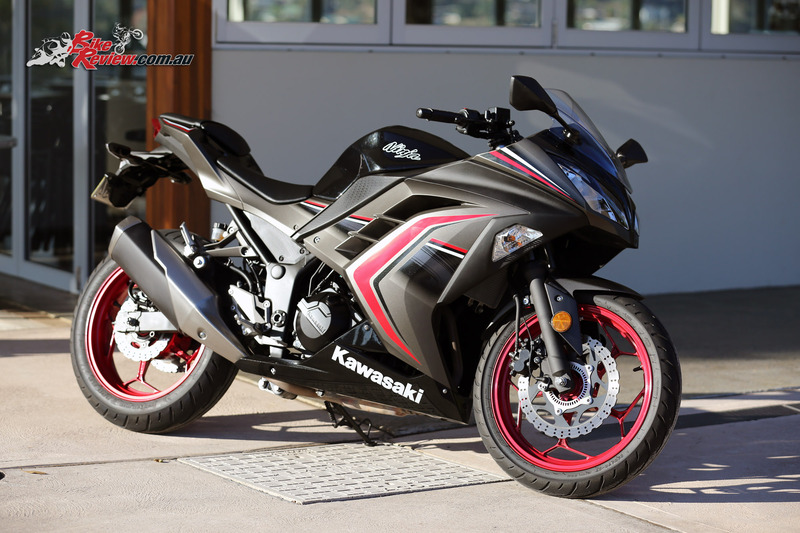 Lime Green/Ebony (KRT Edition) and Passion Red models available without ABS for $5,999/$5,799 + ORC respectively. 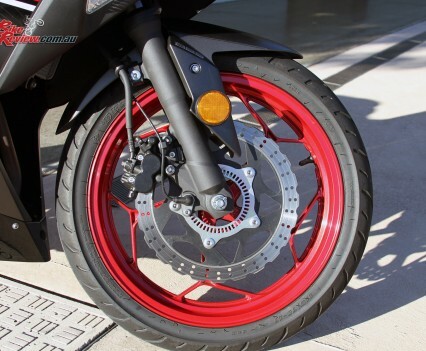 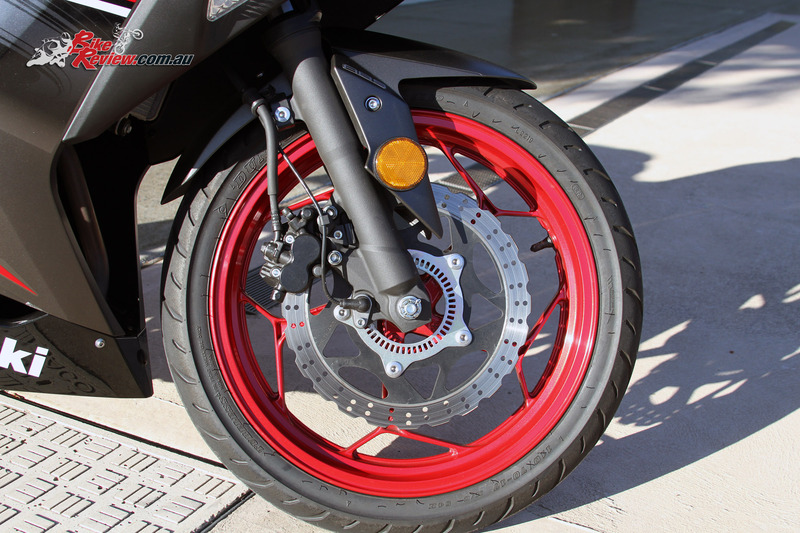 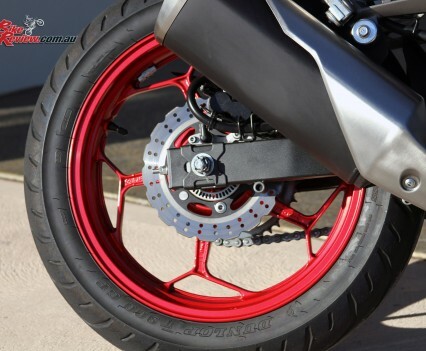 Brakes: Single 290mm petal disc, single balanced actuation dual-piston caliper, single 220mm petal disc, dual-piston caliper.